ALBANY (March 16, 2016) — Stewart Copeland and Jon Kimura Parker are used to breaking the mold. 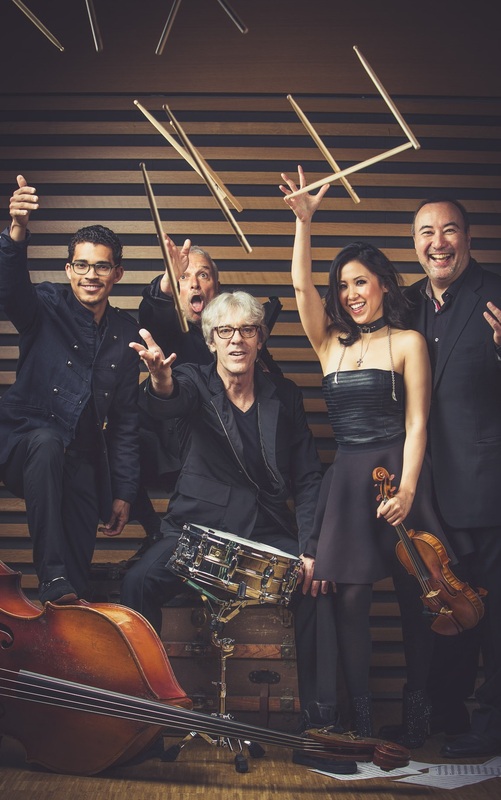 With three incredible collaborators, they have created Stewart Copeland and Jon Kimura Parker & Co., a quintet that has one foot in the classical world and its other foot all over the place. 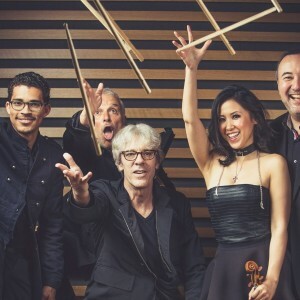 The College of Saint Rose presents Stewart Copeland and Jon Kimura Parker & Co. performing “Off the Score” Thursday, April 7, at 7:30 p.m. in the Kathleen McManus Picotte Recital Hall, Massry Center for the Arts, 1002 Madison Ave., Albany, New York. A presentation of Premiere Performances, tickets are $45 general, $25 students and are on sale now at www.massrycenter.org. For concert and ticket information, contact the Massry Center ticket office at 518-337-4871 or e-mail concerts@strose.edu. “Off the Score” is a sizzling performance collaboration between drum legend Copeland, visionary pianist Parker, Metropolitan Opera Orchestra violinist Yoon Kwon, bassist Marlon Martinez and champion of the electronic valve instrument (EVI) Judd Miller. New works by Copeland and Parker mix with amped-up renditions of great pieces from the classical canon including Ravel’s Piano Concerto in G and Piazzolla’s Oblivion. The debut tour in spring 2015 played to ecstatic crowds who jumped to their feet during Parker’s white hot arrangement of Stravinsky’s The Rite of Spring, which the Toronto Star claimed “single-handedly advanced global warming” when performed as a solo work on his universally praised CD Rite. It is the rare classical musician who can improvise, as it is the rare rock musician who reads music. In this project, all of the musicians can do both. Copeland assembled The Police, the trio that came to include Andy Summers and Gordon Sumner, now known as Sting, in the mid-1970s. After a two-year struggle, The Police metamorphosed into a musical unit that harnessed the energy of punk with formal musical training and an infusion of sophisticated harmonics and reggae dropbeats. The Police became a defining force in popular music throughout the ’80s, before going on an unofficial 23-year hiatus in 1984 after the release of Synchronicity, the group’s fifth and most successful album. As the iconic drummer of The Police, Copeland’s sound is immediately recognizable the world over. He has spent three decades at the forefront of contemporary music as a rock star, acclaimed film composer and film-maker. Now commissioned by the likes of the Royal Opera, Covent Garden, the Cleveland Opera, the San Francisco Ballet and the Symphony Orchestras of Seattle and Dallas to compose operas and symphonic scores, Copeland has immersed himself in the “serious music” world. Most recently, his work Gamelan D’Drum was premiered by the Dallas Symphony in 2011, with his intense new score to the silent era masterpiece Ben Hur unveiled on Easter weekend 2014 at the Virginia Arts Festival and reprised by the Chicago Symphony Orchestra in October 2014. Copeland is a recipient of the Hollywood Film Festival’s first Outstanding Music in Film Visionary Award and a 2003 inductee to the Rock and Roll Hall of Fame. His career includes the sale of more than 60 million records worldwide, five Grammy® Awards and awards from BMI, Cable Ace, Cinequest and Mobius. Meanwhile, Copeland’s travels in search of exotic rhythms and musical celebration have taken him around the world from mysterious Easter Island to Mozambique and from the outback of Australia to the remotest regions of the Congolese jungles. Known for his passionate artistry and engaging stage presence, pianist Parker has performed as guest soloist with the Philadelphia Orchestra and Wolfgang Sawallisch in Carnegie Hall, toured Europe with the Royal Philharmonic Orchestra and André Previn, and shared the stage with Jessye Norman at Berlin’s Philharmonie. Parker has given command performances for Queen Elizabeth II and the Prime Ministers of Canada and Japan, performed for the U.S. Supreme Court, and he is an Officer of The Order of Canada, his country’s highest civilian honor. Parker performs as duo partner regularly with James Ehnes, Aloysia Friedmann, Lynn Harrell, Jamie Parker, Orli Shaham, and Cho-Liang Lin, with whom he has given world premieres of sonatas by Paul Schoenfield, John Harbison and Steven Stucky. An unusually versatile artist, Parker also has jammed with Audra McDonald, Bobby McFerrin and Doc Severinsen. An active media personality, he hosted the television series “Whole Notes” on Bravo! and CBC Radio’s “Up and Coming.” Parker’s YouTube channel showcases the “Concerto Chat” video series with illuminating discussions of the piano concerto repertoire. Opened in 2008, the critically acclaimed Massry Center for the Arts features the 400-seat Kathleen McManus Picotte Recital Hall, Esther Massry Gallery, choral and instrument rehearsal rooms, teaching studios, piano labs and classrooms. Past performing artists have included B.B. King, Chick Corea, Dave Brubeck, Toad the Wet Sprocket, Doc Severinsen, Ramsey Lewis, Maceo Parker, Mary Lambert, Tim Reynolds, Stefon Harris, John Pizzarelli, the Boston Symphony Orchestra Strings, Yuja Wang, Paula Cole and the Preservation Hall Jazz Band. The 46,000 square-foot gem is certified LEED Gold, ranking it among the Capital Region’s most energy-efficient and Earth-friendly buildings.